Post by Dr. Stephen Brough, School of Geography, Politics and Sociology, Newcastle University, UK. There exist thousands of putative debris-covered glaciers in the mid-latitudes of Mars (e.g. Souness et al., 2012; Levy et al., 2014). Much like their terrestrial counterparts, many of these glaciers have undergone mass loss and recession since a former glacial maximum stand (e.g. Kargel et al., 1995; Dickson et al, 2008) (Image 1). However, there is a lack of knowledge regarding the volume of ice lost since that time and whether such recession has been spatially variable. Reconstructing glacial environments based on their landforms and structural assemblage is a powerful concept applied in terrestrial glaciology. Through utilising evidence left on the landscape with observations from modern glaciers, it is possible to reconstruct the extent and dynamics of both former (glaciated) and modern (glacierised) glacial environments (see Bennett and Glasser, 2009). This month’s planetary geomorphology post investigates how similar techniques have been utilised to reconstruct the former extent of glaciers on our planetary neighbour, Mars. Image 1: Glacier recession on Earth and Mars. (a – b) Location of martian glacier in the Phlegra Montes region of Mars’ northern hemisphere (~164.48 oE, ~34.13 oN). Background is MOLA elevation overlain on THEMIS-IR daytime image. (c) Near terminus Context Camera (CTX) image expansion of Phlegra Montes martian glacier. White arrows indicate arcuate ridges in glacier forefield that occupies the southern half of image. Subset of CTX image P16_007368_2152_XN_35N195W. (d) The forefield of terrestrial Midre Lovénbreen, Svalbard, is shown for comparison. White arrows indicate arcuate terminal moraine indicating the glacier’s former expanded extent. Modified from Hubbard et al., 2014. PanCam (Coates et al., 2017) is the imaging instrument on the 2020 ExoMars rover and consists of two wide angle cameras; (WAC’s) and a High Resolution Camera (HRC). PanCam will be used to lead the geological characterisation of the local area outcrops. It will be used to establishing the geological setting of outcrops and identify targets for subsurface sampling and analysis with the ExoMars drill and suite of analytical instruments (Vago et al., 2017). An emulator for the ExoMars PanCam instrument has been used in rover operation field trials in southern Spain. The aim of these trials has been to explore how scientists will use the instruments in rover missions. These images, taken by the emulator, are examples of what PanCam data might look like and show how the PanCam images will be used (e.g., Harris et al., 2015). Image 1: PanCam Multi-spectral images: (A) A colour composite made from the red, green and blue filters shows a ridge named ‘Glengoyne’ at approximately 20 m distance from the rover. (B) A Multi spectral image using the geology filters stretched to emphasise the variation in the scene. Which morphologic features of sedimentary systems persist into the stratigraphic record? Ancient river deltas preserved as stratigraphic deposits on both Earth and Mars exhibit remarkable morphologic similarities to modern deltas on Earth (Images 1-3). While channel dynamics may be expected to alter the geomorphic expressions of past channel networks, in many cases channel bodies appear to be preserved in their original configurations. Fully understanding the ways in which geomorphic features become preserved as stratigraphy can provide tools for us to both infer past processes from the ancient deposits with greater confidence, as well as to predict the geometries of ancient deposits in the subsurface (i.e. for resource exploration). Image 1: CTX image mosaic of a delta in the Aeolis region of Mars, showing distributary channel networks. CTX imagery courtesy of NASA-MRO/JPL/UA. The Largest Delta on Mars? Post by Jacob Adler, School of Earth and Space Exploration, Arizona State University. Ancient river deltas are found in many locations on Mars [see Di Achile & Hynek, 2010 and references therein], and are formed as sediment drops out of suspension in water as it approaches a wider shoreline of a lake, sea, or (debatably) an ocean. 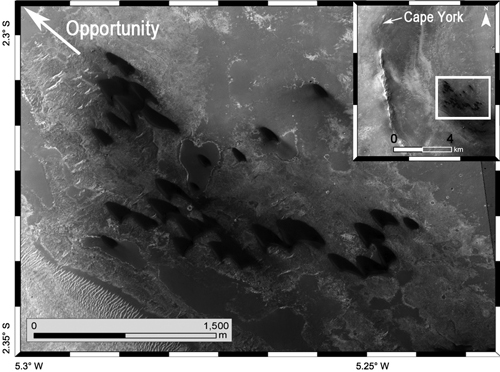 Some proposed deltas on Mars are found in closed basins (e.g. an impact crater) away from the Martian dichotomy boundary, implying an ancient climate during which the crater ponded with water [e.g. Eberswalde or Jezero]. Occasionally, inlet and outlet river valleys are seen at different elevations along the crater rim, lending further evidence to the hypothesis that the crater filled with liquid water at least up to the outlet elevation. Deltas found in open basins, on the other hand, imply a larger body of standing water, and Mars scientists look for other clues to support the deltaic rather than alluvial fan formation mechanism. In our recent papers, we tested whether the Hypanis fan-shaped deposit (Image 1) could be a delta, and discussed whether this supports the hypothesis that there was once a large sea or ocean in the Northern plains of Mars [Adler et al., 2018; Fawdon et al., 2018]. Image 1: a) The Hypanis deposit stands out as light-toned in the center of this Mars Reconnaissance Orbiter (MRO) Context Camera (CTX) mosaic of our study region. 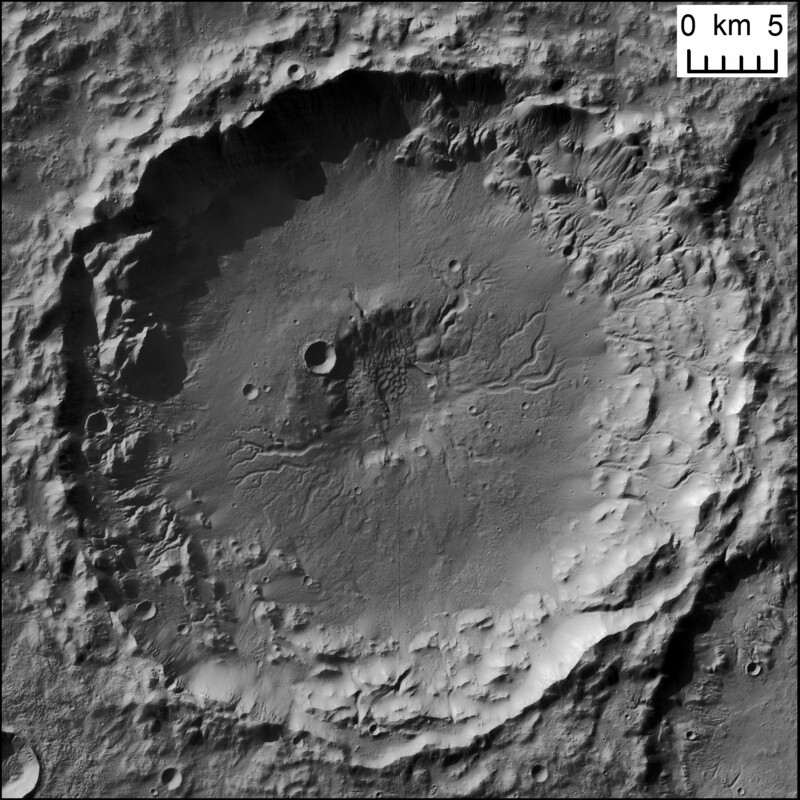 Also marked are Lederberg crater, and the Sabrina deposit in the closed basin of Magong crater. (b) Hypanis and Sabrina have a low nighttime temperature (dark) as recorded by the THEMIS instrument on Mars Odyssey, suggesting it is mostly composed of small grain size material. Image from the Nighttime IR 100m Global Mosaic v14.0 [Hill et al. (2014); Edwards (2011)] and from the Northern Hypanis Valles Night IR Mosaic [Fergason (2009)]. NASA/JPL/ASU. (c) Our proposed fluvial sequence discussed in the paper. Main lobe (A) could once have had continuous layered beds spanning to the distal island deposits (E). The cross-cutting relationships we observed are consistent with hypothesized shoreline regression to the north. Flow migrated to the northern lobe (B), then to braided inverted channels (C and D) as water retreated. NASA/MSSS/USGS. d) Our digital elevation mosaic shows the topography of Hypanis and surrounding features. Elevations are colored from white (-2500 m) to light green (-2800 m). One of the most environmentally diagnostic features of sedimentary rocks is cross-bedding, which occurs when sediment is transported by wind, water, or volcanic processes, resulting in horizontal strata composed of inclined beds. The geometry of cross-bedded sedimentary deposits provides information about the depositional setting and post-depositional history of the rocks, making the identification, measurement, and interpretation of cross-beds particularly interesting on Mars, where past conditions are of great scientific interest. This post describes cross-bedding in Upper Aeolis Mons in Gale crater (Image 1). 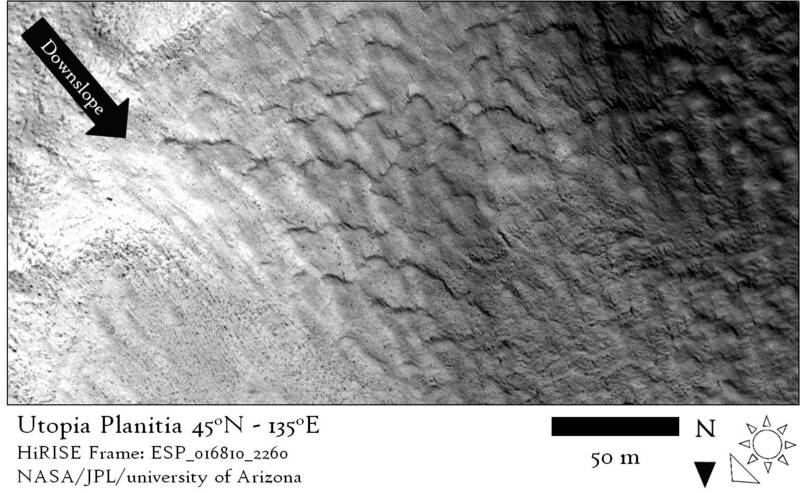 Image 1: Example of complex bedding patterns in upper Aeolis Mons, interpreted to be large-scale aeolian cross beds. Image is an inset of HiRISE observation PSP_001620_1750. Post by Peter Grindrod, Natural History Museum, London, UK. A number of different studies have catalogued features on Mars that could be given the general heading of sedimentary fans [e.g. Irwin et al., 2005; Kraal et al. 2008]. These features occur whenever the velocity of a river or stream decreases, and the water no longer has enough energy to carry its sediment, and thus begins to deposit its load. This drop in energy often occurs when the water flows into flatter and wider regions. 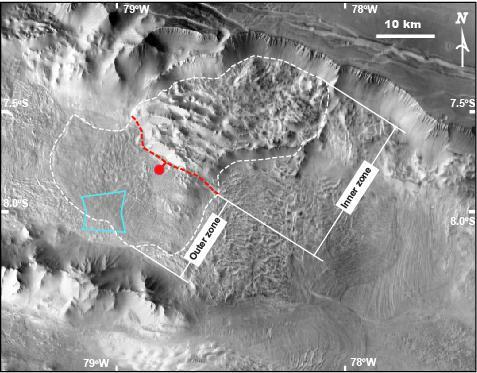 The distribution of these fans on Mars is important because it shows the location of past water flows, and the amount of material that has been transported (which can be used as a proxy for flow duration). However, one of the fundamental problems when looking at these features with orbital data alone, is that it is difficult to determine whether the river flowed into a standing body of water (for example a lake) or just an empty canyon or crater. Of course, the implications of this problem are important if we want to understand the volume and distribution of past water on Mars, which in themselves feed into understanding the past climate and even habitability of Mars. 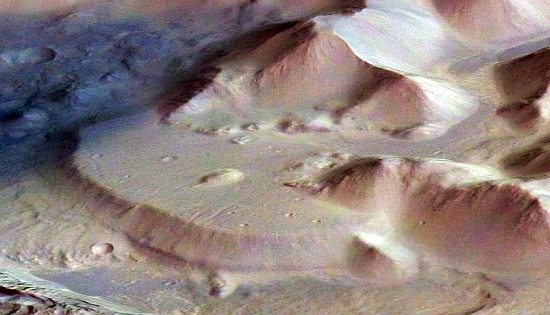 Image 1: Location of the two fans in Coprates Catena, SE Valles Marineris. MOLA elevation overlain on THEMIS daytime image. Post by Frances. E. G. Butcher, School of Physical Sciences, Open University, UK. Thousands of putative debris-covered glaciers in Mars’ middle latitudes host water ice in volumes comparable to that of all glaciers and ice caps on Earth, excluding the Greenland and Antarctic ice sheets (Levy et al., 2014). 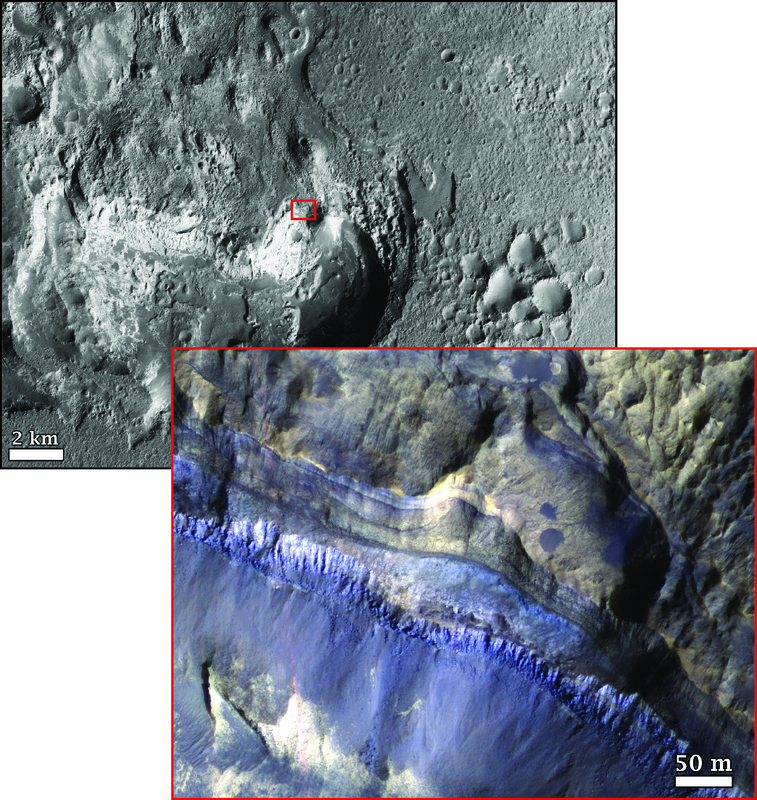 These glaciers formed within the last 100 million to 1 billion years of Mars’ geological history (Berman et al., 2015), a period that is thought to have been similarly cold and hyper-arid to present-day Mars. This is broadly corroborated by a sparsity of evidence for melting of these geologically ‘young’ mid-latitude glaciers, which suggests that they have always been entirely frozen to their beds in ‘cold-based’ thermal regimes, and haven’t generated meltwater (e.g. Marchant and Head, 2007). Nevertheless, this months’ planetary geomorphology image provides evidence for melting of one such glacier. Image 1: An esker emerging from the tongue of a debris-covered glacier in Tempe Terra, Mars. See Image 2 for an annotated 3D view of this scene. The dashed white line delineates the terminus of the debris-covered glacier, which occupies the southern and eastern portions of the image. The white arrow marked A indicates the first emergence of the crest of the esker ridge from the glacier surface. The white arrow marked A’ indicates the northernmost end of the esker ridge in the deglaciated zone beyond the ice terminus. Context Camera image P05_002907_2258_XN_45N083W (Malin et al., 2007). Modified from Butcher et al., 2017 under a Creative Commons license CC BY 4.0. Volcanism is an important process which shapes the surfaces of all terrestrial planets, and is still active on Earth, Jupiter’s moon Io, and perhaps on Venus. On Earth, volcanoes with wide variety of shapes and sizes exist; however, the size of volcanoes is anti-correlated with their frequency, i.e. small volcanoes are much more numerous than large ones. The most common terrestrial volcanoes are represented by kilometre-sized scoria cones (Figure 1a). These are conical edifices of pyroclastic material originating from explosive volcanic activity. Degassing of ascending magma causes magma fragmentation on eruption piling up the pyroclasts around the vent as a cone. 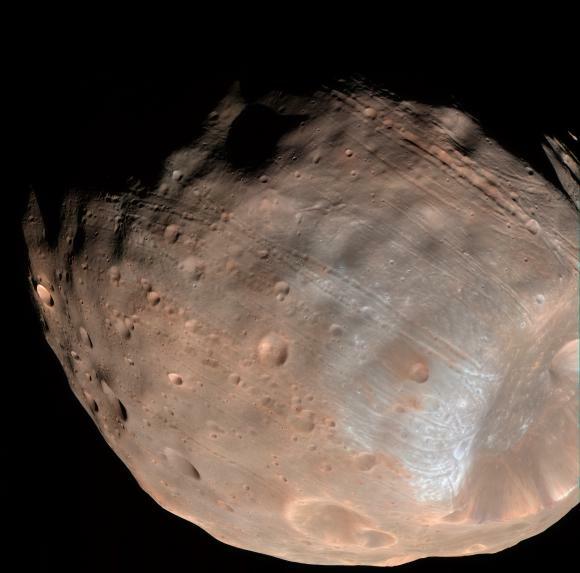 Interestingly, scoria cones as known from Earth, have not been observed commonly on any other terrestrial body in the solar system despite the fact that magma degassing, and hence magma fragmentation, has to occur on these bodies as well. Figure 1: Example of a terrestrial scoria cone (panel a, Lassen Volcanic National Park, California, photographed by the National Park Service) and its putative martian analogue (panel b, detail of CTX image P22_009554_1858_XN_05N122W). The similarity of water-formed landforms on Earth is often used as a key argument for the involvement of liquid water in shaping the surfaces of other planets. The major drawback of the argument is “equifinality” whereby very similar looking landforms can be produced by entirely different processes. A good illustration is leveed channels with lobate deposits (Image 1). Such landforms can be built on Earth by wet debris flow, lava flow, pyroclastic flows and they are also found on Mars (de Haas et al., 2015; Johnsson et al., 2014) where the formation process is debated. Image 1: Lobes and levees, scale bars are 50 m in all cases. Wet debris flow deposits in Svalbard, image credit DLR HRSC-AX campaign. Lava flows on Tenerife, aerial image courtesy of IGN, Plan Nacional de Ortofotografía Aérea de España. Self-channelling pyroclastic deposits at Lascar volcano, Chile, Pleiades image. Depositional lobes in Istok crater on Mars, HiRISE image PSP_007127_1345. Ripples cover the surfaces of sand dunes on Earth and Mars. On Earth, ripples formed in typical aeolian sand (e.g., 0.1 and 0.3 mm) range in wavelength between 10 and 15 cm and display a highly straight, two-dimensional crestline geometry. Ripples are thought to develop through a process dominated by the ballistic impacts of saltating sand grains in which wavelength selection occurs through the interplay of grain size, wind speed, the saltation trajectories of the sand grains, and ripple topography. Debris-covered glaciers are glaciers whose ablation zones are at least partially covered by supraglacial debris. On Earth, debris-covered glaciers are found in all major mountain glacier systems. The debris itself is primarily derived from rockfall above the accumulation zone. This material becomes entrained in the accumulating ice and is carried englacially before emerging in the ablation zone. 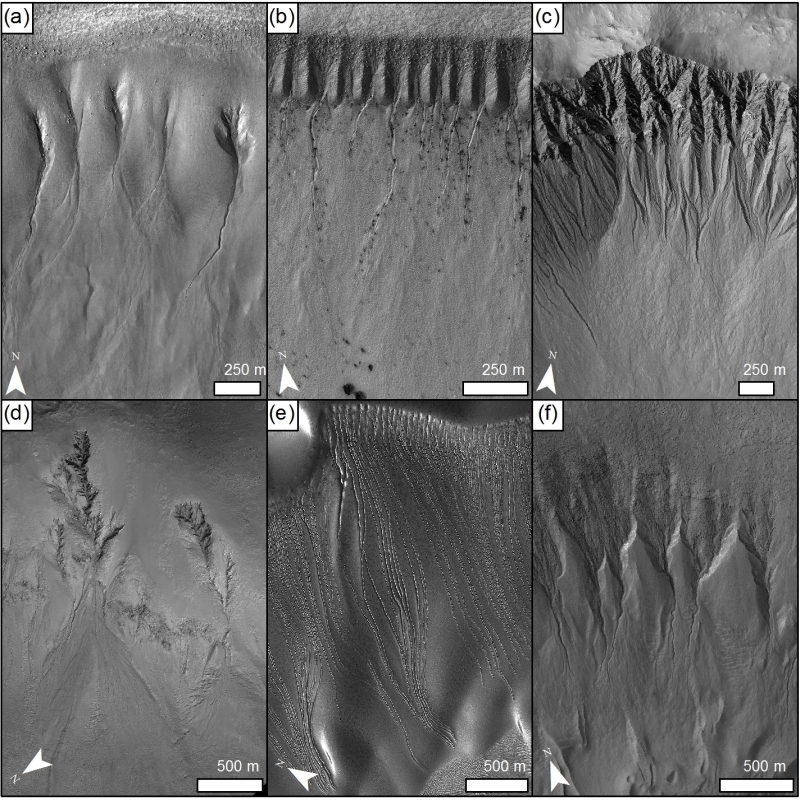 On Mars, numerous mid-latitude landforms have been interpreted as debris-covered glaciers based on their geomorphic similarity to nearby ice-rich landforms such as lobate debris aprons (LDA), as well as their similarity to terrestrial debris-covered alpine glaciers (Head et al., 2010 and refs. therein). Image 1: Aerial photo of Mullins Glacier in Beacon Valley, Antarctica, a debris-covered glacier and possible analog to certain landforms on Mars. USGS aerial photo TMA 3080/275. Available from http://www.pgc.umn.edu/imagery/aerial/antarctica. Post contributed by Peter Fawdon, Dept. of Earth and Planetary Sciences, Birkbeck, University of London, UK. Volcanism is an important process that can be observed on the surface of many planetary bodies. Not all magma bodies erupt extrusively onto the planet’s surface, many simply stall within the crust, cooling slowly over millions of years to form igneous intrusions. On Earth erosion and uplift expose the frozen core of ancient volcanoes relatively frequently, however, it is considerably more difficult to investigate this intrusive magmatism on other planets. Figure 1 shows a perspective view across Nili Patera. This view is generated in ArcScene using data from a mosaic of three CTX elevation models and orthoimages. The view shows Nili Tholus and the associated bright central lava unit as well as the graben along the top of the uplifted region of the western caldera floor. Figure 1: Terrestrial maars. (a) is a group of three maars filled with water in the Eifel region, Germany (rim-to-rim diameter ~0.5-1 km) (“Maare” by Martin Schildgen – Own work. Licensed under CC BY-SA 3.0 via Wikimedia Commons – https://commons.wikimedia.org/wiki/File:Maare.jpg#/media/File:Maare.jpg). (b) shows the Wabah maar, located in Saudi Arabia (rim-to-rim diameter ~2 km) (courtesy of Vic Camp, San Diego State University). Terrestrial maar-diatremes are small volcanoes (see this previous post for a general description) which have craters whose floor lies below the pre-eruptive surface and are surrounded by a tuff ejecta ring 2-5 km wide (Figure 1) that depends on the size of the maar itself and on the depth of the explosion (Lorenz, 2003). Maar-diatremes constitute highly valuable sites for in situ investigations on planetary bodies, because they expose rocks at the surface from a great range of crustal depths and are sites which could preferentially preserve biomarkers. Post contributed by Francesco Salese from IRSPS/Dipartimento INGEO, Università D’Annunzio, Pescara, Italy. Mars, is one of the planetary bodies where water flowed and where it may transiently flow today under certain conditions. Many martian paleodrainage systems and well-preserved fluvial and lacustrine deposits have been recognized and studied in the last two decades (see further reading). Widespread dendritic valley networks and the presence of extensive fluvial features on ancient martian terrains suggest that a relatively “warm and wet” climate was prevalent early in the planet’s history (about 3.7 Ga). This is in stark contrast with the hyper-arid, extremely cold climate that is thought to have persisted from 3 Ga until the present (Amazonian Era). The subject of this post is Moa Valles [Salese et al., 2016], which is a 2 billion year old paleodrainage system (Figure 1) that is nearly 300 km long and is carved into ancient highland terrains of Tempe Terra in the northern hemisphere of Mars. Understanding the origin and evolution of this type of complex and interconnected paleo-fluvio-lacustrine system is critical for understanding the early martian climate. 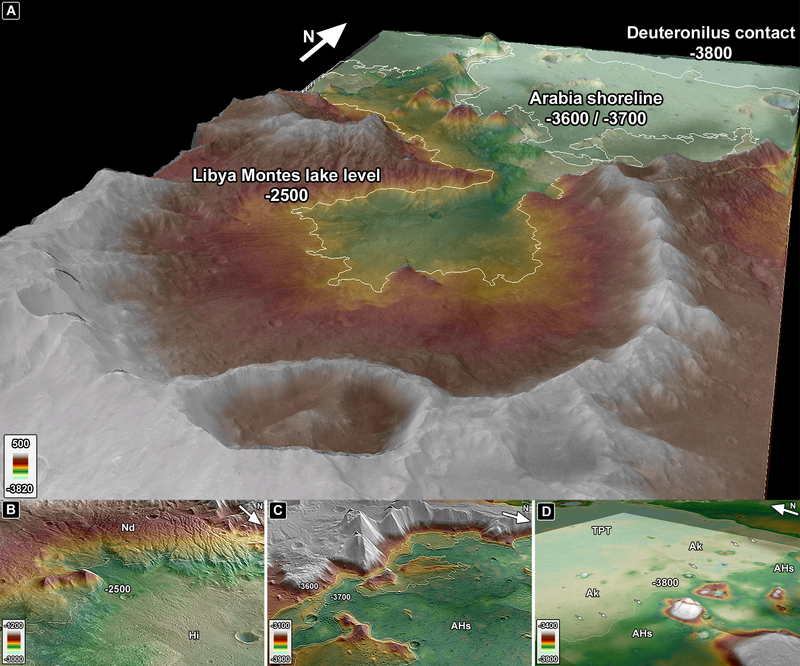 Figure 1: The upper panel shows the THEMIS-VIS daytime mosaic of Moa Vallis system.The lower panel is a line drawing showing the channel system in blue lines, red dotted lines represent wrinkle ridges, the drainage basin is delimited in grey, and fan-shaped and deltaic deposits in orange. The total mapped length of the channel as shown here is ~325 km, and the flow direction is towards the east. Post contributed by Lujendra Ojha, Georgia Institute of Technology. Recurring slope lineae (RSL) are dark, narrow features forming on present-day Mars that have been suggested to be a result of transient flowing water. RSL extend incrementally downslope on steep, warm slopes, fade when inactive, and reappear annually over multiple Mars years (Images 1 and 2). Average RSL range in width from a few meters (<5 m), down to detection limit for the High Resolution Imaging Science Experiment (HiRISE) camera (~0.30 m/pixel). The temperatures on slopes where RSL are active typically exceed 250 K and commonly are above 273 K. These characteristics suggest a possible role of salts in lowering the freezing point of water, allowing briny solutions to flow. 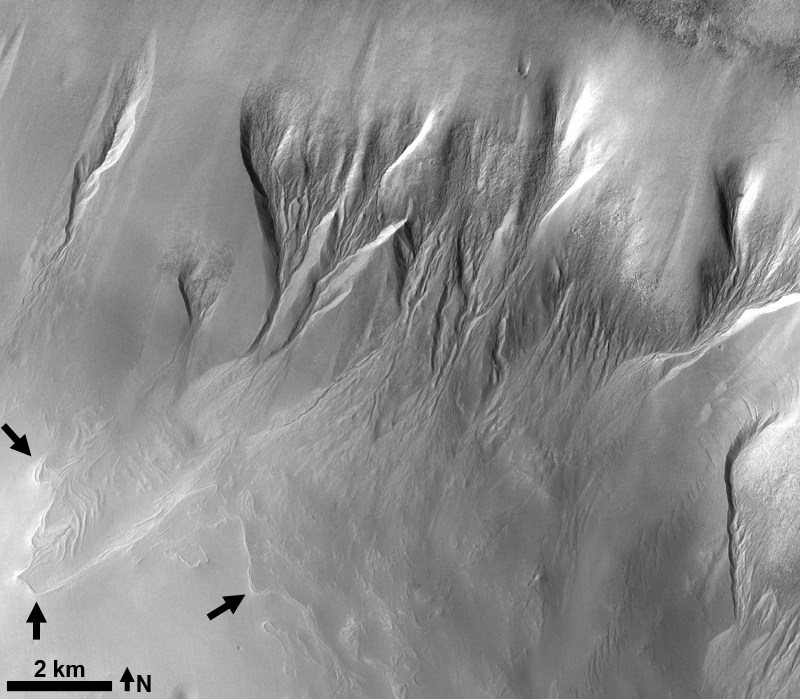 Image 1: RSL flowing downhill on the steep slopes of Palikir crater in the southern mid-latitude of Mars. Credits: NASA/JPL/University of Arizona. Post contributed by Dr. Wouter Marra, Faculty of Geosciences, Universiteit Utrecht. There are many water-worn features on the planet Mars, which contribute to the reconstruction of former hydrological conditions. For example, dendritic valley networks show that there was precipitation in the Noachian, the oldest epoch on Mars more than 3.7 billion years ago (Craddock and Howard, 2002). In contrast, fluvial morphologies in younger terrains seem to originate from groundwater (e.g. Baker and Milton, 1974). These are valleys that appear suddenly in the landscape, for example the large outflow channels (e.g. Mangala Vallis and Kasei Vallis) and theatre-headed valleys (such as Nirgal Vallis). However, such systems and their implications are poorly understood. To better understand the formation of such landscapes, I performed several scale-experiments focused on the fundamental process and resulting morphology. Image 1: Landscapes formed by seepage of groundwater. Left are photos from the experiments, right are examples of Martian cases. 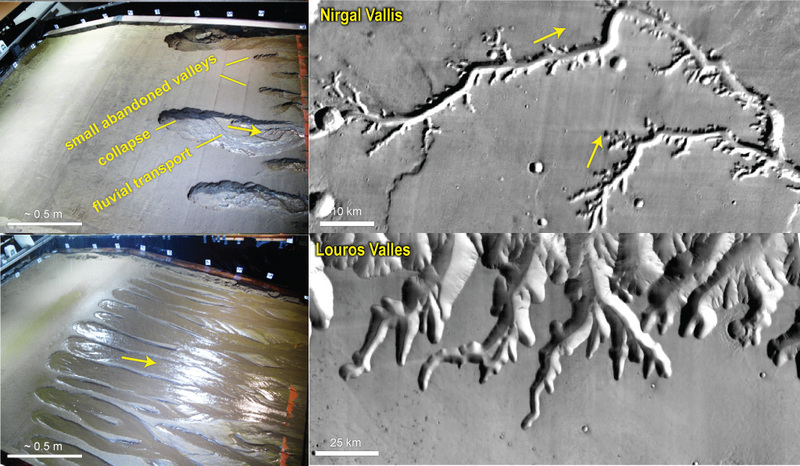 Top images show seepage from a distal source, characterized by many small valleys in between large valleys as result of flow convergence to the large valleys. Bottom images have a local source of groundwater, which results in the formation of many valleys of similar size. Arrows indicate (inferred) flow direction. Martian images are from THEMIS daytime infrared. Post contributed by Joel Davis, Department of Earth Sciences, University College London, UK. During the last few decades, dry river valley networks and delta fan structures have been found to be increasingly common on ancient terrains on the martian surface (e.g. Goldspiel and Squyres, 1991; Hynek et al., 2010). They are considered to be one of the main lines of evidence that Mars once had Earth-like precipitation and surface runoff (e.g. Hynek and Phillips, 2003). One such location is the south-western Melas basin, part of a collapsed graben structure on the southern wall of Melas Chasma, Valles Marineris – Mars’ equatorial canyon system (Images 1 & 2). The basin likely formed in the early Hesperian period (~ 3.7 – 3.5 Ga), soon after Melas Chasma opened. Post by Mr Martin Voelker and Dr. Daniela Tirsch, Institute of Planetary Research, German Aerospace Center, Berlin. In July 2012 the Context Camera (CTX) on board Mars Reconnaissance Orbiter (MRO) observed an upcoming and well-defined dust storm in a giant impact basin in the southern hemisphere on Mars known as Hellas Planitia. Although this deep lowland is notable for its dust storms, this image shows a unique view of a nascent storm system; from its first gusts to its shredded front. Post contributed by Jessica Watkins, Dept. of Earth, Planetary, and Space Sciences, University of California, Los Angeles, USA. Long-runout (> 50 km) subaerial mass movement is rare on Earth but it is one of the most prominent geomorphic processes shaping Valles Marineris in equatorial Mars. It has occurred widely and nearly continuously within the canyon system over the past 3.5 billion years (Quantin et al., 2004). Image 1: Long-runout landslide in Ius Chasma, Valles Marineris, with characteristic zoned morphology. Blue box indicates location of spectral map in Image 3. Image is Thermal Emission Imaging System (THEMIS) daytime infrared mosaic. Layered deposits on Mars are a globally-pervasive record of the sedimentary history of the planet. These deposits not only preserve long sequences of Mars’ stratigraphic record, but also exhibit evidence for hydrous minerals and aqueous activity, and thus help to define the habitability through time. Layered deposits are therefore high priority exploration targets for current and future missions, including the Mars Science Laboratory Curiosity Rover, which currently sits at the base of an interior layered deposit (ILD) in Gale Crater. Image 1. A typical landslide in Valles Marineris, Mars. CTX DTM made at the UK NASA RPIF (Regional Planetary Image Facility) at University College London. Images B21_017688_1685_XN_11S067W and B22_018321_1685_XN_11S068W. Image credit: NASA/JPL/Malin Space Science Systems. Post contributed by Dr Andreas Johnsson, Department of Earth Sciences, University of Gothenburg, Sweden. 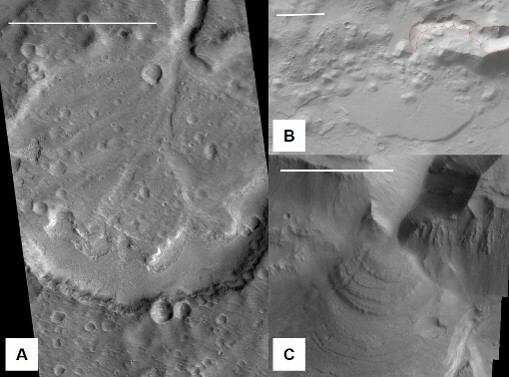 The question whether Martian gullies formed by fluvial processes or by dry mass wasting have been a source of heated debate ever since their discovery (Malin and Edgett, 2000). 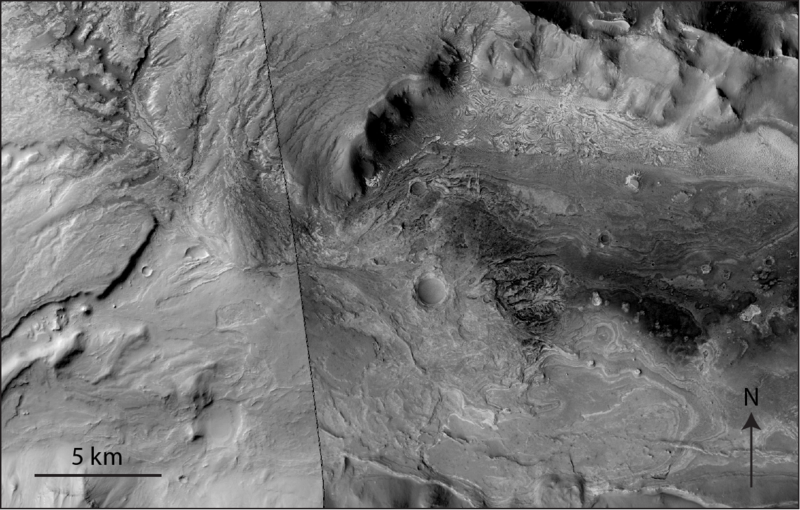 Intense research within the last decade however points to a fluvial origin for a majority of gully landforms on Mars. Image 1. A) Overview of the pole-facing interior crater wall (PSP_006837_1345). B) Clearly defined paired levee deposits (white arrows). C) Multiple overlapping lobate deposits (white arrows). 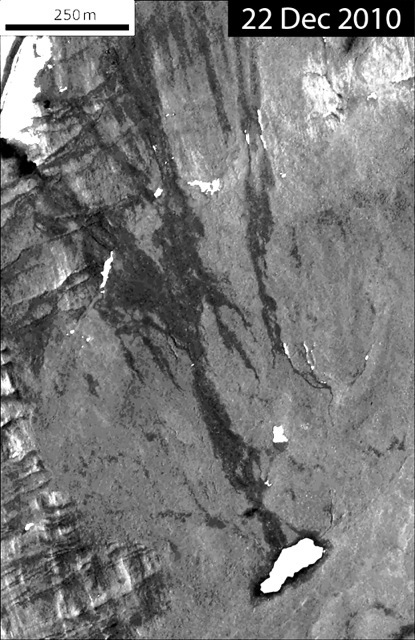 D) Gully fan dominated by debris flows (white arrows). E) Well defined medial deposit (debris plug) (white arrow). Image credit: NASA/JPL/UofA for HiRISE. Post by Dr. Alberto G. Fairén, Dept. of Astronomy, Cornell University, USA, and Centro de Astrobiología, Spain. Gale crater, the site of the currently active Mars Science Laboratory (MSL) or Curiosity Rover mission, is a ~154-km-diameter impact crater formed during the Late Noachian/Early Hesperian at the dichotomy boundary on Mars (Cabrol et al., 1999; Anderson and Bell III, 2010; Wray, 2013). The northern floor and rim of Gale are ~1–2 km lower in elevation than its southern floor and rim, and the crater shows a layered central mound named Aeolis Mons, which is 100 km wide, extends over an area of 6000 km2, and is up to 5 km in height (Malin and Edgett, 2000). 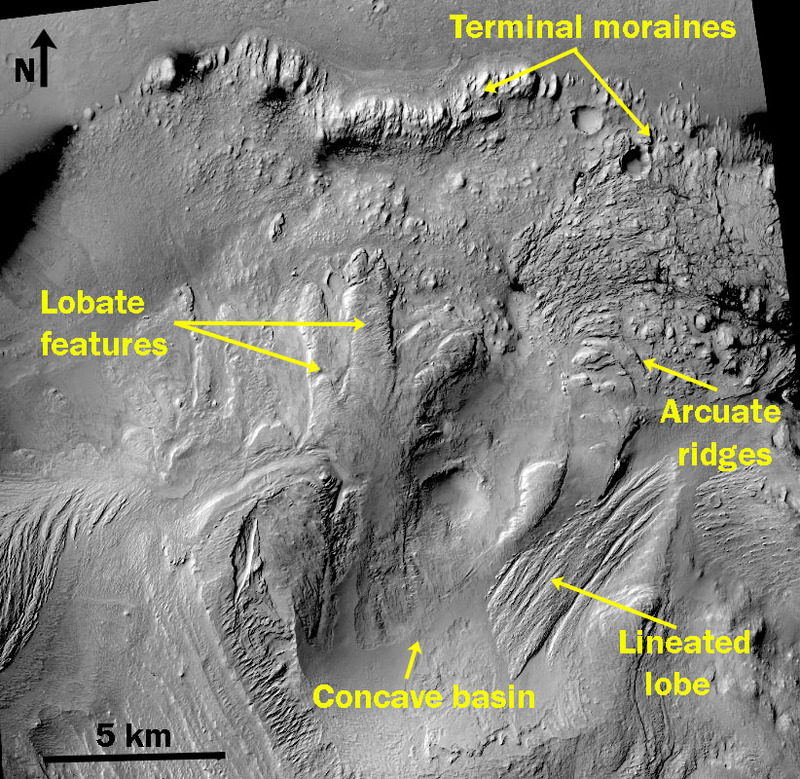 Image 1: Details of the lobate features, arcuate ridges and terminal moraines in the central mound of Gale. Post by G. de Villiers, Faculty of Geoscience, Utrecht University. 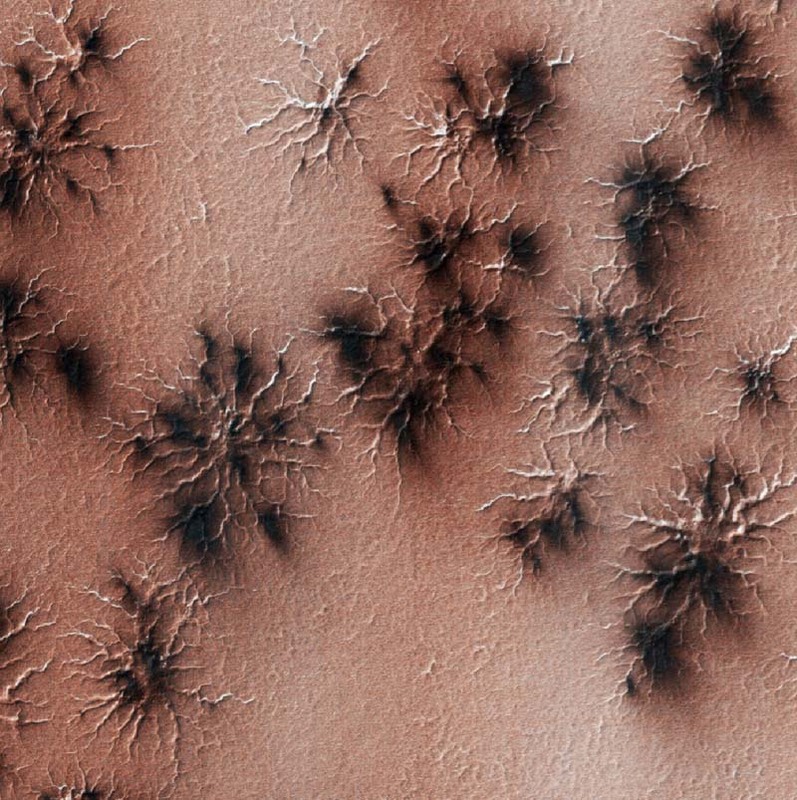 Fan-shaped deposits have been identified on the surface of Mars (Image 1). These sediment bodies often occur within impact craters and, specifically in the cases of fan deltas, suggests that these craters were once lakes early in Martian history. Fan delta morphologies are indicative of upstream (e.g. flow discharge and sediment properties) and downstream (e.g. basin characteristics) parameters, from which the hydrological conditions at the time of formation can be inferred (e.g. Kleinhans et al. 2010). Image 1: Examples of fan delta deposits on Mars, formed in enclosed impact crater or rift basins. A) Single-scarped, branched prograding delta (PSP_006954); B) Single-scarped, smooth prograding delta (I10805012); and C) Multiple-scarped, stepped retrograding delta (V17040003). White line is approximately 5 km. Post by Dr Neil Coleman, University of Pittsburgh. A group of Martian craters formerly contained lakes, some of which overtopped and breached the crater rims to cause flooding and channel erosion. Image 1: View of Morella Crater and the complex of Elaver Vallis channels eroded by floodwaters released when the crater rim was breached. The distal reaches of Elaver Vallis were obliterated by the southward expansion of Ganges Chasma, which is 5 km deep. The chasma as seen today did not exist during the Elaver flood, otherwise high groundwater pressures would have been relieved by breakouts in the walls and floor of the chasma [graphic is a mosaic of THEMIS daytime infrared (IR) images]. There is much morphologic evidence that there was flowing water on the surface of Mars early in its history. Such evidence includes fluvial channels and valleys, often termed valley networks, (e.g., Pieri, 1980; Irwin, 2005a; Fassett and Head, 2008a) as well as paleolake basins that are fed by these valley networks (e.g., Goldspiel and Squyres, 1991; Cabrol and Grin, 1999, 2001; Irwin et al., 2005b; Fassett and Head, 2005, 2008b). Image 1. Exposed layered deposit of probable lacustrine origin within an open-basin lake (-27.7°N, 76.1°E). Inset image (indicated by red box in main image) shows detailed layering within the exposed deposit. Main image is from the Context Camera (CTX) instrument (image number B02_010338_1518_XI_28S282W; ~5 m/pixel), and inset image is from the High Resolution Imaging Science Experiment (HiRISE) instrument (image number PSP_010338_1525; ~50 cm/pixel). Post by Dr Norbert Schörghofer, University of Hawaii, Honolulu. Slope streaks are a form of down-slope mass movement on the surface of Mars that frequently occurs on Mars today (Image 1 and 2). Slope streaks were first identified on high-resolution Viking Orbiter images, but their present-day activity was only discovered in Mars Orbiter Camera (MOC) images. Image 1. A portion of a Mars Orbiter Camera image taken on 1999-10-28. Image 2: An Image of the same area taken on 2002-06-10. A large new slope streak formed, while numerous other streaks persisted. North is up and illumination is from the lower left (Schorghofer et al. 2007). 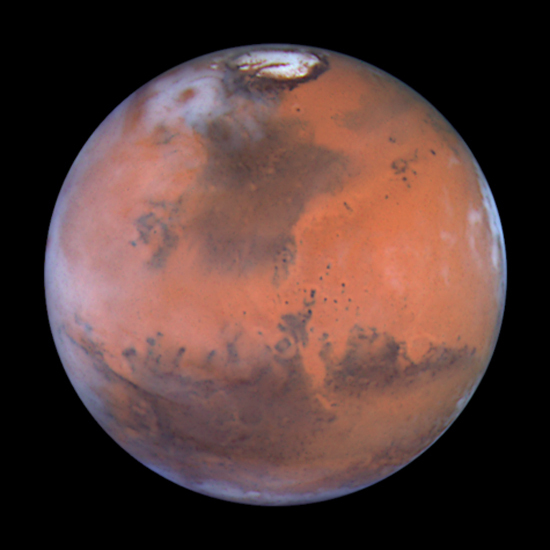 The hypothesis of ancient Martian standing bodies of water, which might have occupied the lowlands of the northern hemisphere and which might have existed in local- to regional-scale paleolakes once in Martian history, is one of the most important subjects of ongoing discussion in Mars research (e.g., Parker et al., 1989, 1993; Head et al., 1999; Cabrol and Grin, 1999, 2001; Clifford and Parker, 2001; Kreslavsky and Head, 2002; Carr and Head, 2003; Ghatan and Zimbelman, 2006; Di Achille and Hynek, 2010; Mouginot et al., 2012). 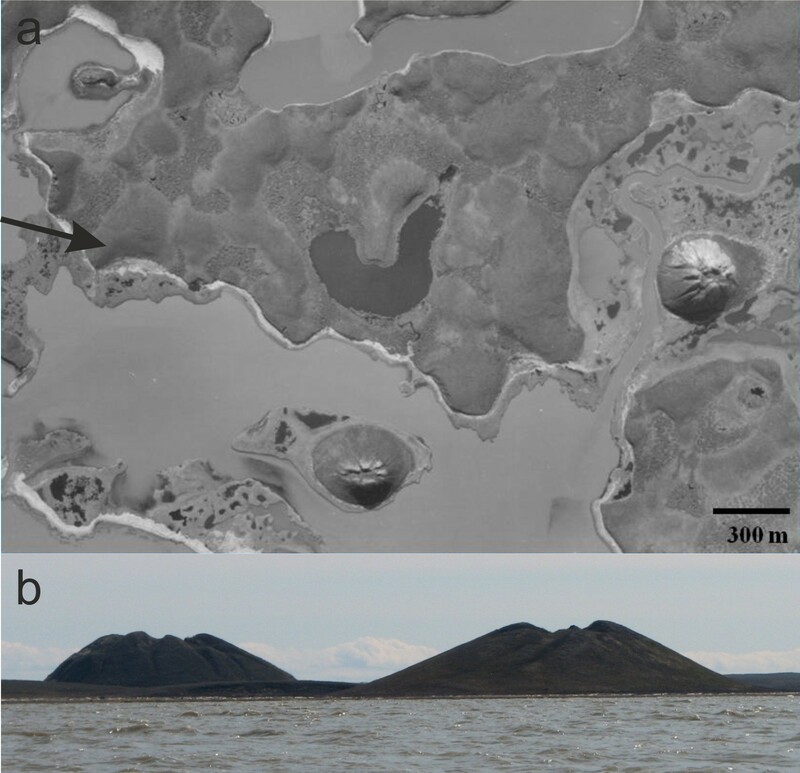 The case for large standing bodies of liquid water, including lakes, seas and oceans, is attributed to a complex hydrologic cycle that may have once existed on Mars in the Noachian (>3.7 Ga) and perhaps also in the Hesperian (>3.1 Ga). Post by Samantha Peel Department of Earth and Planetary Sciences, University of Tennessee, USA. Central pit craters are a crater type that contain an approximately circular depressions in their floor or central peak (Image 1). These craters have been found on Mars, Ganymede, and Callisto (e.g., Barlow, 2010; Alzate and Barlow, 2011; Bray et al., 2012). On Mars, a subset of central pit craters has been found to contain valleys that terminate in central pits (Peel and Fassett, 2013). These “pit valleys” are believed to have formed as ancient rivers transported water and sediment to the central pits. Image 1: Mosaic of three MRO CTX images (B18_016770_1429_XI_37S201W, B19_017192_1443_XI_35S202W, B19_016981_1432_XN_36S201W) showing the interior of a well-preserved central pit crater with pit valleys. The crater is located at 36.30ºS, 158ºE. Every year, Mars’ polar regions are covered by a seasonal layer of CO2 ice (dry ice). We are just beginning to understand the important role this volatile plays as an active agent of geomorphic change on Mars. The HiRISE camera on the Mars Reconnaissance Orbiter has been used to study sublimation activity in the spring for 3 Mars years. C hannel features often organised in radial patterns were noted and known informally as “spiders”, more formally as “araneiform terrain” (Image 1). They are tens to hundreds of m wide, with individual channels measuring several meters wide. Estimates of depth are in the order of ~ 2 m, decreasing with distance from the center of the araneform. Thin channels widen and deepen as they converge. Where they drape pre-existing topography, the channels are larger in the uphill direction suggesting they were eroded by pressurised fluid (Hansen et al, 2010). Image 1: Subset of HiRISE Image ESP_011420_0930 locatedf at 87.0°S / 127.27°E. A variety of patterns of channels have been carved in the surface and are conformally-coated with seasonal ice. At the time this image was taken, L s = 184.3 (southern spring), the sun had just started peeking above the horizon and the scene is covered with the seasonal ice cap, ~1m thick. Araneiform channels in this image are 1-2 m deep and ~3-5 m wide. 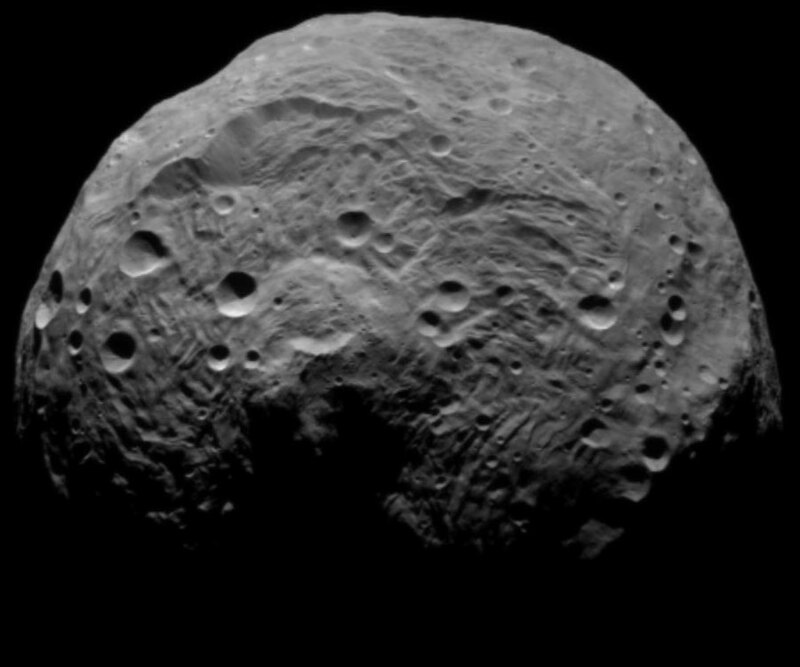 The image is 1 km across. Aeolian transport of sand-sized particles on planetary surfaces is both enhanced and inhibited by the presence of topography. Mountainous topography at all length scales significantly affects dune location, size, shape, and orientation [Pye and Tsoar, 1990]. The surface of Mars has both abundant sand dune populations and substantial topographic relief. Perhaps the best example of the relationship between topography and relief is the ancient rift valleys of Valles Marineris, with over ~21,000 km2 of dune fields found within the ~10 km deep rift system [Chojnacki and Moersch, 2009]. This system of interconnected-chasms, provides natural sinks where wind blown sediment can accumulate. Additionally, the substantial relief and the resulting atmospheric pressure gradient significantly influence the regional meteorology [Rafkin and Michaels, 2003]. Dune fields in Valles Marineris can be broadly divided into two classes: floor- and wall-related dune fields. The “wall dunes” class dune fields are interpreted as climbing and falling dunes [Chojnacki et al., 2010]. On Earth, climbing dunes are formed when migrating dunes encounter and ascend a substantial slope or cliff (>10°), where there is no major wind flow blockage [Pye and Tsoar, 1990]. Falling dunes, found on the downwind side of large topographic highs, are formed by unidirectional down slope winds and gravity [Greeley and Iversen, 1985]. 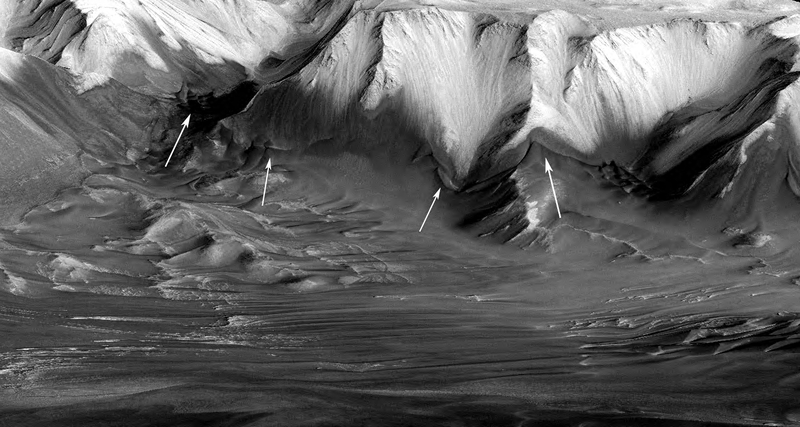 Image 1: Oblique southward perspective views of Melas Chasma climbing dunes using a CTX Camera image (P16_007245_1648) over HRSC elevation (H0334). The white arrows indicate slip faces and are consistent with upslope transport. Vertical exaggeration is 2x. Several large, overlapping basins dominate the northern hemisphere of Mars, and are collectively termed the northern lowlands. This ancient basin has been infilled by sediments and hosts some of the darkest terrains on the planet. A new spectral investigation of these dark terrains has revealed that they are almost entirely composed of iron-bearing glass. This is the first detection of glass on Mars, as most other martian surfaces exhibit a typical basaltic composition with abundant olivine and pyroxene. In total, glass-rich materials cover nearly ten million square kilometers in the northern lowlands (Horgan and Bell, 2012). Post by Dr. Maarten G. Kleinhans River and delta morphodynamics research group, University of Utrecht, The Netherlands. Image 1: Subscene of HRSC image presented in Kleinhans et al. 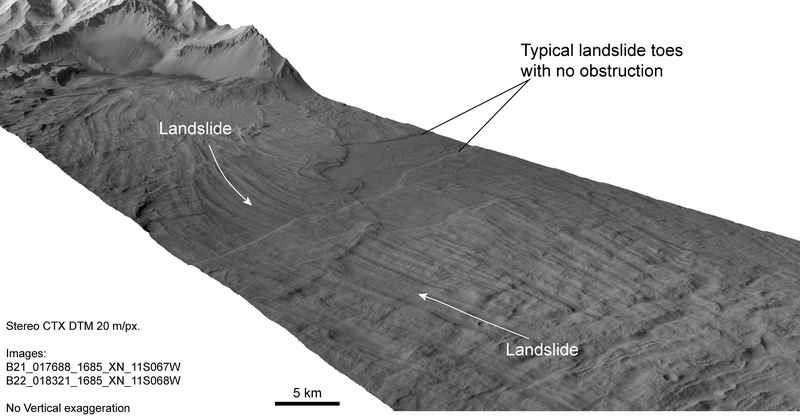 (2010) showing an oblique view on a classic bed load-dominated Gilbert delta with a subaqueous lee slope at an angle of about 30°. Delta is about 5 km wide. 1Assistant Research Planetary Scientist, UC Santa Cruz, USA. 2Planetary geosciences group, Brown University, Providence, Rhode Island, USA. On Earth, cold-based glaciers (glaciers deforming internally, without basal melting and basal sliding) are found in the coldest environments (e.g., Antarctica, Marchant et al., 1993). Unlike the majority of glaciers, cold-based glaciers do not scour their substrate and leave pre-glacier topography unaffected. When cold-based glaciers advance and then dynamically stabilize (the ice flow is balanced by frontal ice ablation); debris carried forward by the glacier drops out at the glacial fronts as sublimation of the ice occurs; the dropped material produces so-called drop moraines. In three locations at high northern latitudes of Mars, overlapping small ridges of arcuate planforms associated with slopes were interpreted as drop moraines left by extinct cold-based glaciers (Garvin et al., 2006; Kreslavsky and Head, 2011). Image 1 shows one of these locations, where a presumable glacier was formed at south-eastern part of an impact crater rim. The shapes of the extinct glacial lobes around the central peak of the crater suggest a few hundred meters thickness of the glacier. 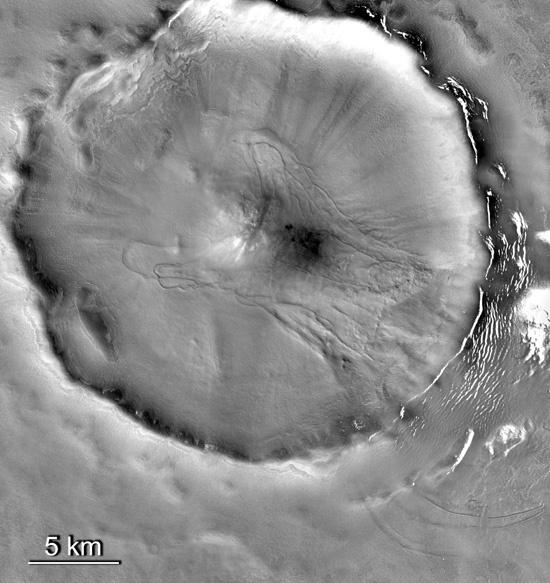 Image 1: Unnamed impact crater in the Northern Lowlands on Mars at 70.3oN, 266.5oE with loop-shaped ridges interpreted as drop moraines created by carbon dioxide glaciers. Image captured by Context Camera onboard Mars Reconnaissance Orbiter, image number T01_000876_2505 Illumination is from lower left.